Does Gen Chem Grade Predict Organic Chemistry Grade? At this point, you’ve likely heard it a hundred times—organic chemistry isn’t like any other course you have taken/will take in college. And this includes general chemistry, right? Well, it’s complicated. So let’s take a look at some data. Since organic chemistry is such an infamous course, a surprisingly large amount of research has been done on different methods to teach the course most effectively. One study looked at performance in general chemistry versus organic chemistry and found that there is a statistical difference between “A” and “B” students (p=0.000) and “A” and “C” students (p=0.000), but no difference was found among “B” and “C” students. In plain English: if you did well in general chemistry, you are more likely to do well in organic chemistry. 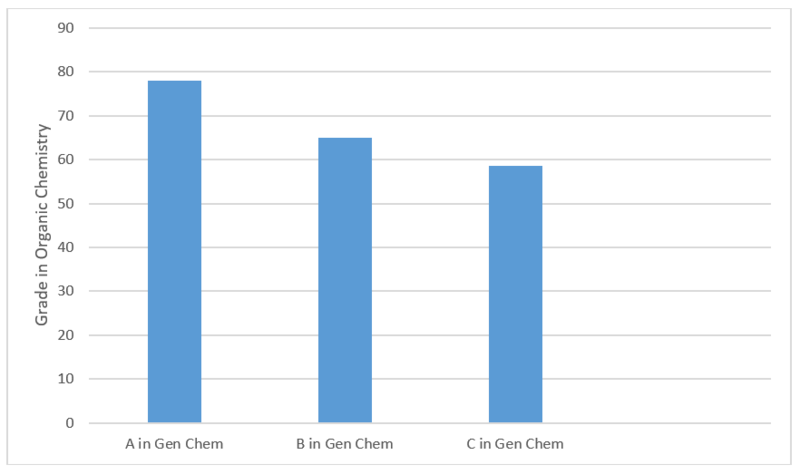 The data clearly show that there is an undeniable relationship between organic chemistry grade and general chemistry performance. If you did well in general chemistry, you are more likely to do well in organic chemistry. But it get’s more complicated when you try to think about why. Do general chemistry and organic chemistry share the same problem-solving abilities? Or is there simply just a group of highly motivated students who study a lot and therefore do better in general chemistry and organic chemistry (and probably their other courses too)? Most likely, it is a combination of these. General chemistry is much more math-focused, while organic chemistry isn’t, instead relying on an understanding of conceptual application (you won’t need to use a calculator to do an organic chemistry problem). But if a student is a great problem-solver in general, then this skill might help in both organic chemistry and general chemistry. Furthermore, if a student is extremely motivated to achieve A’s, then this student is of course more likely to score higher in both organic chemistry and general chemistry. If you did well in general chemistry, then great! There is a clear relationship between the grades in general chemistry in organic chemistry. If you did NOT do well in general chemistry, then that’s still okay too. Because there are other factors at play (such as intrinsic motivation) that certainly impact your grade. Stay tuned next week for an in-depth review of the motivational factors that lead to the most success in organic chemistry (hint: simply getting an “A” in organic chemistry is low on the list). https://orgomadesimple.com/wp-content/uploads/2016/04/New_logo-1-300x175.png 0 0 ruge@bc.edu https://orgomadesimple.com/wp-content/uploads/2016/04/New_logo-1-300x175.png ruge@bc.edu2018-07-27 07:51:072018-07-27 07:51:07Does Gen Chem Grade Predict Organic Chemistry Grade? The 3-Step Method to Successful Organic Chemistry Studying What Motivates the Top-Scoring Students in Organic Chemistry?